Smart item search is an improvement on ServiceM8’s original online item search. The search shows you not only the item number and name of items, but their description and price. Making it much easier to select the correct item. Smart item search disables the search function in the item name field and allows you to search for either item code or name in the item code field. Which solves the rare issue of the item changing when you enter an alternate name for an item. With the normal item search, you can click the drop-down list for item code or item name to search. 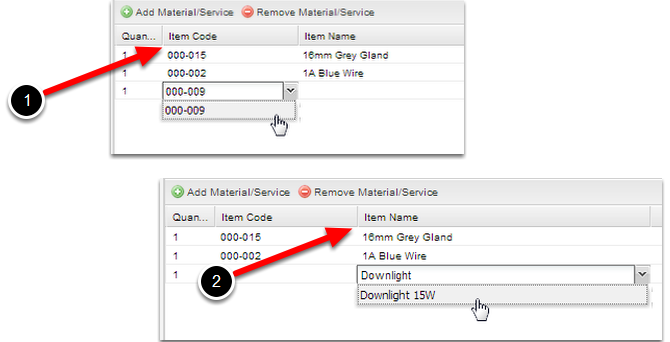 This is the normal item search by default and it shows only the item code and name for the material / service. 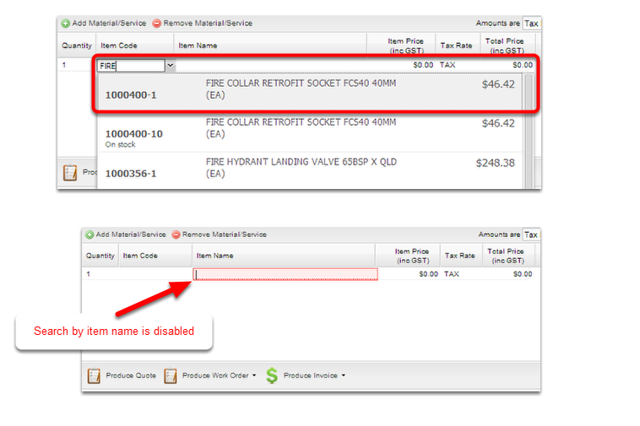 With the Smart Item Search, you can type in the keyword in the Item Code or click the drop-down list to search. Activating the Smart Item, the search shows the item number, name of items, description and price. But it disables the search function in the item name field.